My hotel in Nauders in Tyrol. With #einfachmehrerleben we are celebrating something special. Taking it one step further, we are defining a completely new holiday feeling. With the panorama sky pool above the roofs of Nauders. Three-country-culinary-art and an impressive spa-wellness-paradise in a prime location: in the heart of the border triangle. What we mean by “prime location” is that you can continue carving right up to the front door of our hotel in Nauders, Tyrol. It also means that the world of the mountains is only a stone’s throw away from your wellness apartment – and so are countless hiking fairy tales, bike challenges and impressions of nature. To inspire each and every day. It's all about this. 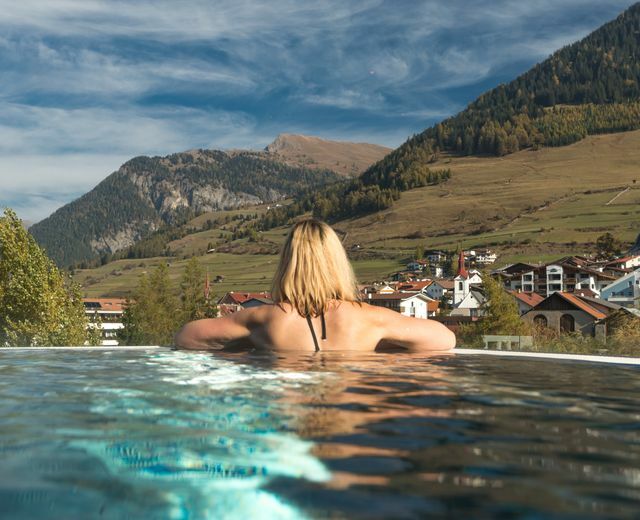 The wellness world of Mein Almhof Hotel has received several awards and, with its new Panorama Wellness & Spa and the unique Sky Pool above the roofs of Nauders, will send your senses on a special journey. On more than 4.500 m² of indoor and outdoor space, more than ten different saunas and steam baths, panorama pools and stylish relax oases will delight you. With a separated area for adults only, an attractive family spa and a rich selection of precious treatments. Variety which simply tastes better. With the freshest ingredients from the region as well as a secret ingredient which makes each of our master dishes an irresistible taste highlight: love. The world of relish at Mein Almhof Hotel enchants you in Italian, Tyrolean and Swiss. International inspiration – realised with ground contact. Creative. Refined. Varied. Discover it now – with the deluxe board at Mein Almhof Hotel and in one of our three exclusive à la carte Restaurants. Feel the tingling of summer. Experience the whole abundance of the border triangle. No matter whether in hiking boots, on your mountain bike or when driving your motorbike: with Mein Almhof, you start your holiday adventure in the pole position – and conquer new horizons. Alone, together with your friends and family or with our experienced active mountain guides. Incomparably alpine – with valuable insider information for even more mountain experience. The nature is waiting to be explored! Relax in our Spa refuge spread across 3,000m² (8 different saunas, aromatic steam bath, panoramic relaxation rooms, sun decks in all directions, wellness garden with outdoor sauna and outdoor whirlpool - refreshments and vitamins are available from the tea bar, including fresh local spring water!